A powerful desktop app for creating responsive websites using the Bootstrap framework. Bootstrap Studio is a desktop application that helps you create beautiful websites. It comes with a large number of built-in components, which you can drag and drop to assemble responsive web pages. It is built on top of the hugely popular Bootstrap framework, and exports clean and semantic HTML. Thousands of developers and designers use it every day. We are sure you’ll love it too! Bootstrap Studio comes with a large number of pretty components for building responsive pages. We’ve got headers, footers, galleries, slideshows and even basic elements like spans and divs. If you need a component which doesn’t exist in our library, just click the Online tab in the Component Panel. There you will find thousands of components built and shared by the community. You can also upload your own. If you have a website that you’ve developed previously, you can import it. 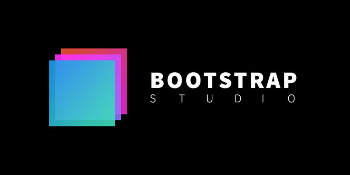 Just drag and drop the HTML, CSS, JS files and images into Bootstrap Studio and they will be added to your project. Bootstrap Studio knows how to construct a valid Bootstrap page and automatically writes the correct HTML. It supports Bootstrap 3 and will be updated to Bootstrap 4 once it’s out. – Automatic backups are here! Your designs are backed in the background, minimizing the chance of lost work. You can control the behavior in Settings > Backups. – Labels can now be exported as Start/End comments. – Copying multiple files between designs is now supported. – UX Improvements: better drag indicator, click to collapse sidebars, export notification.